The Aran Islands of Inismor, Inismeáin & Inis Óirr are located thirty miles out in the Atlantic Ocean off the West coast of Galway, Ireland. They're part of the Gaeltacht region & Gaeilge - the native Irish language is the main language spoken by the islanders. While their inaccessibility from the mainland may have isolated them from mainstream Irish culture in the past, it also helped keep many of the old traditions alive. Todays island community have radio, television & mobile phones to keep abreast of national & international developments. There remain many stone forts including Dún Chonchúir, castles & ancient ruins of defensive installations, evidence of the islands' historical role in protecting the mainland. Our photographs are of Inismeain, the middle of the 3 islands. The island which has been inhabited since c7000BC has remained relatively unspoilt by modern advances, with a current population of under 250. The photographs below were taken by Brendan Doyle on one of his many visits to the region in the early 1960's. 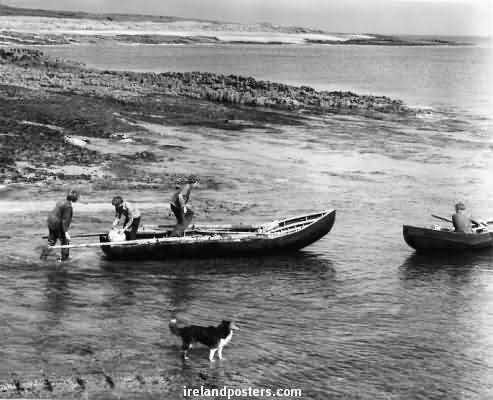 Vintage Co. Galway Ireland images of Aran islanders & Currach boats, Inismeáin 1961. Currach boat at Inismeáin seashore, old Aran Island Ireland photograph. Currach boats at sea off Inis Oirr Aran island, O'Briens castle in background. 1960's Ireland photographs by Brendan Doyle. Images copyright © Irelandposters. 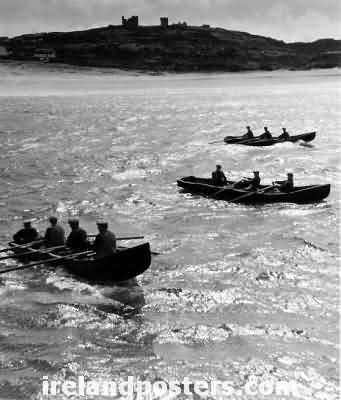 Old Irish movie clip - 1950's Inismaan Aran islanders & Currach boats. 19th century Galway Ireland black & white photos - vintage Irish images. Aerial photo of Trim village & Trim castle County Meath, 1962 black & white photo. O'Connell Street bridge & Guinness barge - 1930's Dublin images. Irish photos & Ireland posters - main contents.